That Eric Lindros has been passed over five times for induction to the Hockey Hall of Fame proves he is every bit as divisive in retirement as he was during a superlative playing career. And that's a shame because by any objective measure and most subjective ones, he deserves enshrinement. 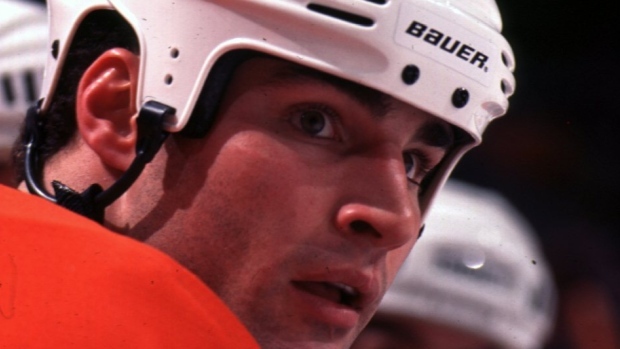 Love him or hate him, there's no denying Lindros' profound impact on the game. The Hall of Fame is intended to be a permanent residence for those who left indelible marks on the game. Lindros' was written in black marker punctuated with an exclamation mark! He was a force of nature the game had never seen before and has not seen since. Lindros was the ultimate power forward. A bigger Mark Messier, playing at 6-foot-4 and 240 pounds. It boggles the mind his seismic significance, however injury-interrupted, however muted measured against his own possibilities, has not earned him the ultimate endorsement of individual achievement. It's hard to understand how Lindros has never received the minimum 14 of 18 votes and even harder to understand that during his eligibility period (since 2010), the Selection Committee has left a total of four player election slots unfilled. Only one of a maximum four players was elected in 2010 and just three earned 75 per cent support in 2013, meaning that at least two years Lindros' omission can't simply be explained away by the presence of an overcrowded eligibility class. Voting for the 2015 class is not until June, but during the week the hockey world gathers to honour its newest class of officially certified eternal stars of the game, it bears repeating: Lindros belongs among them. 1. He ranked third in points per game (1.31) to the legendary Mario Lemieux (1.99) and certain first ballot Hall of Famer Jaromir Jagr (1.42) during a decade of dominance (1992-93 through 2001-02). Lindros averaged more than a point per game every season (except 2000-01 which he missed entirely). He ranked just 15th in points because he missed so much action, playing only 79 per cent of games. 2. Lindros won one Hart Trophy during his career and while more might have been expected when he entered the league in 1992 as the most celebrated prospect since Lemieux, consider this: Every Modern Era Hall of Fame-eligible Hart Trophy winner but one – Chicago goalie Al Rollins - is in the Hall. 3. Longevity is a major measuring stick, but not the only one. Ken Dryden (397 games), Bobby Orr (657), 2014 inductee Peter Forsberg (706), Cam Neely (726) and Mike Bossy (752) are five all-time greats elected to the Hall of Fame despite playing fewer than Lindros' 760 games. Each of them proved in relatively short periods of time they deserve membership in hockey's most exclusive club because they all had an influence on hockey history. So did Lindros. 4. Lindros and Theo Fleury are the only two Hall of Fame-eligible players who averaged more than a point per game in both the regular season and playoffs not in the Hall. 5. Lindros has holes in his resume and had his warts. He never won a Cup, which should be a non-factor, and he never won a popularity contest … except among fans, who registered their votes each and every night they paid to watch him play. He was the show. Eric Lindros cut something of a solitary path through a controversial career, but it should nonetheless lead to the Hall of Fame. The Hall of Fame Selection Committee faces an entirely different choice when it comes to another man who went his own way – albeit to different effect. The late Winnipeg-based agent Don Baizley had as high profile a practice – representing the likes of Anders Hedberg, Ulf Nilsson, Jari Kurri, Joe Sakic, Forsberg and Paul Kariya – as he did maintain a low profile among all but the hockey intelligentsia. Former Winnipeg journalist Vic Grant is trying to change all that; he is heading up a group that nominated Baizley for the Hall of Fame. I was among those who contributed supporting letters. There are those who establish identities unlike any other. Baizley, a player agent for five decades, was one of these men. He was a pioneer - playing a major role in facilitating the first wave of European players to North American hockey - and a peerless advocate for players and the game, itself, during a turbulent period of the sport's history. Baizley was an original thinker whose counsel was sought by people at all levels of hockey - on and off the ice and on both sides of the management-labour divide. He conducted himself professionally and personally with the utmost integrity. He was regarded as the most respected man in hockey and he used his position and powers of persuasion, not just for the betterment of his players, but for the sport. Baizley was, indeed, a builder. A builder of consensus whether in the thick of contract negotiations or discretely to the side in collective bargaining negotiations. No agent has ever been named to the Hockey Hall of Fame, but Don Baizley would be a worthy consensus choice to be a pioneer one more time.